Crawley Town did not deserve to lose to MK Dons, but Paul Tisdale said he does not mind how his side win at the moment. 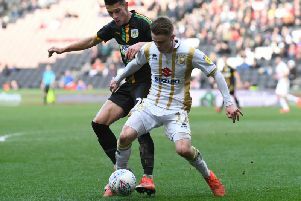 Gabriele Cioffi's side arguably had the better of the chances at Stadium MK, but Kieran Agard's opportunist strike four minutes before the interval ensured Dons picked up their fourth win in a row. Tisdale praised Crawley for their approach, but said once his side got their noses in front, they controlled the flow of the game. "They didn't deserve to lose today – not at all," said Tisdale of Crawley. "Once we got ahead, we did really well to restrict them to a small number of chances. Every game is different, the pressure mounts, the stakes get higher and we have to be ready. We've had to be adaptable, and manoeuvre our positions to get some flow in the game. I think Conor McGrandles played about four positions today. But we're over the line and on to the next. "I think we're all of the same opinion – it's three points, it doesn't matter how they come."